While nutritionists and experts are busy trying to retract all the unhealthy and overbearing chronic illnesses they come across certain things that help drastically improve our overall health. Well this is exactly what has happened as of recently. Let me put it this way: Almost 30% of Americans are now considered to be obese which is over 75 million people. If that doesn’t freak you out and make you nervous that we are headed in a downward health spiral, you may want to know that 1 in every 3 children are also considered to be obese and projections show at this rate 2/3rds of kids will be obese by the year 2030. This is opening up the floodgates for chronic illness such as cardiovascular disease, cancer, high blood pressure, high cholesterol, heart problems and heart attacks, Alzheimer’s and that’s just the tip of the iceberg. But leading the charge all these start with obesity. Well let me get back on track with how this fatty acid known as Conjugated Linoleic Acid (or CLA) can help reverse these effects on your body. 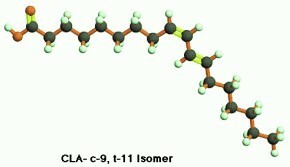 CLA is a more recently discovered good fat that is found to help block all three stages of cancer even when used in small amounts. The problem is with our Americanized Western Diet, meaning foods highly processed or fast-foods, we rarely get ANY conjugated linoleum acids in our system. But they discovered that CLA’s have been a critical fatty acid for the body ever since the first spear was thrown in the hunter/gatherer diet. The reason is because you find this in healthy grass fed game animals, something which we don’t get unless we eat grass finished cows or get our foods primarily from farmers or nutritional supermarkets like Whole Foods. The reason is because CLA’s are found in especially cattle like cows that can grass year round on healthy pesticide free grasses instead of feedlots which feed these animals corn or soy, almost 85% of which is genetically modified and not a part of these animals natural diet. This opens up a whole slew of other problems but the important thing to note is that grass-finished cows (meaning they are fed grass up until the day of slaughter) are far more healthy and their meat contains three times more CLA in their meat. Additionally, you can find CLA’s in these same animals milk too and also up to 86% more vitamin E than regular feedlot cows too. Well since CLA is so prevalent in milk from grass finished cows this is what makes whey protein powder one of the best ways ways to gather this superior healthy fatty acid. Because whey protein comes from as a by-product of the milk and cheese process you can get your daily allowance of this quite easily in a delicious smoothy with just a small scoop of whey. So it’s important for your health and the health of your kids to start by figuring out how to begin eating more healthy and to reverse the obesity epidemic that is running rampant. A great way to do that is to start by eating fresh organic fruits and vegetables that are pesticide free and also supplementing this type of diet with the best whey protein powder out there. If you do this you will not only feel incredibly better and get a natural boost in energy but you will be getting all the vitamins, nutrients, minerals, essential fatty acids, and antioxidants your body needs throughout the day. So do the wise thing, listen to what your body needs, lose the gut or love handles, and start feeling better today. Hope you enjoyed the post and I’ll see you guys soon.